I’ve written about the Craftsbury Marathon but there has been more — not a whole lot more — due to this challenging Northeast winter. The return to the Boston area was marred by lack of snow — natural or otherwise — at Weston. There was barely a kilometer of poorly groomed manmade stuff, typical to what we would have in early December, which meant for limited terrain and crowded conditions as the high school and EMBK skiers spread across the track, stopped or fell at inopportune locations. Throwing down high-speed intervals in that crowd made for some creative skiing but not dissimilar from a typical Tuesday Night Race. Eventually cold temperatures and even a little natural snow allowed the loop to expend to nearly 2.5 km, but that still felt woefully short. The new operators still have a lot to learn about grooming and snow making. A marginal year could have been much better. On MLK day, I drove up to Bretton Woods to ski the Geschmossel on a thin, abbreviated course. We drove through falling snow, heavy at times, and into an welcomed winterscape in the shadow of Mt. Washington. Despite the additional snow, the recommendation was still to use your “rock” skis. Since my race skis are essentially rock skis at this point, it was an easy decision. As was waxing. Since most of the long, steep hills had been removed, I applied a very thin layer of VR40 kick wax which left my skis fast with just enough grip for the few times I needed it. Three strange things happened in this race. 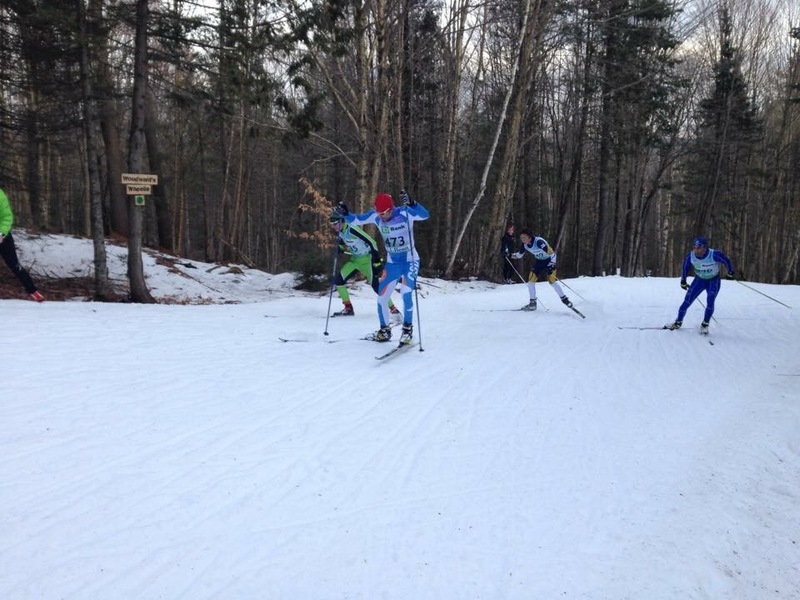 The Craftsbury Marathon is always characterized by the waxing speculation, weather forecasting, waxing panic and special combination of experience and voodoo to arrive at the right wax job. The one that will withstand 50km of climbing and descending. The one that will adapt to a temperature range that can swing dramatically over the course of the 3 hour race. The one that will give you reliable kick with no penalty for speed. Each year I’ve done Craftsbury, the simpler wax job has prevailed. Don’t over think it. K.I.S.S. Keep it simple, stupid. But that slipped my mind as I got wound up in the decision between stick wax, klister, and covered klister. Was the snow transformed and aggressive? Or was it refreshed by the recent stuff that had fallen. Would it warm up and cause the klister to ice? Or would the temperatures hold? Should I go with my tried and true race skis? Or use the special klister ones that seemed to have been designed just for these conditions? The ones that I’d never really been able to make work for me? The ones that just a few weeks ago I had decided to get rid of? In retrospect, it should have been an easy decision. Even in warm-up, testing identical wax jobs — Swix KR50 covered with VR45 — on the two pairs of skis, even skiing one of each pair on different feet, I should have made the right call. Even if the skis felt virtually the same. Because this year was going to be different. I’ve never quite had a good Craftsbury. The first year was a death march. I bonked hard. The second year, my arms cramped up. Two years ago, Torin Tucker tragically died on the course. Last year, separated ribs, temps that never broke single digits and 60-grit snow made it the slowest edition I’d ever done – though I did win my age group. This year was different. I was healthy. I was fit. I was even excited to race it. And I wanted something special, something magical. And I thought it would come from those Carbonlites with the short, high wax pocket. While the skis performed well in warm-up, once I was at race pace and on the hills, I realized my error. I’ll take some credit for figuring out that quickly. But that left with about 45km to absorb it. The defect was simple enough. The skis were too stiff and/or the kick zone too short. It kept them fast , but my striding had to be perfect. Every stride had to be perfect. Once I lost the rhythm, I started to slip, then started to flail, and couldn’t bring it back together. And each slip sent a jolt of uncompensated energy return into my hips and back. It would have been better to just go for herringbone up the hills. But I was convinced I could get on top of my technique. Because when I did get could kick, it was amazing. The problem was, I was only getting it 60 or 70% of the time. As I result, I watched my competition float away up the hill. No kick = no glide. And no momentum. I was working hard just to minimize my losses. And my hip flexors and iloapsoas were getting hammered quickly. It didn’t help that I fell the first time down Elinore’s Hill. The damn skis again. I got my weight a little back and was instantly bum sliding down the track. The other pair were just more stable…more familiar. After 2 laps, I was cooked. With 2 more to go. I could barely manage a crawl up the hills. My arms were cratered from catching myself each time I slipped. So I put myself into the hurt tunnel and settled in for a long ski. I briefly considered abandoning. But I knew that would leave a worse feeling. So I raced for my own dignity. I toughed it out. Even while I continued to fade. Even as I was passed by first and second place in my age group. Even while I knew I could have been having a very different race, if I had trusted my gut and left the klister pair at home — or in the trash, which was where I intended to leave them. But I’ll never know for sure. And that’s the obsessive beauty of it. Because there will likely never be another day quite like that one. But that won’t stop me from re-playing it over and over again. And wondering. What if. And if there is another similar day…. I know which skis NOT to use.